Bronchiectasis was a common disabling and fatal condition in the pre-antibiotic era and remains more common in medically underserved regions of the world. Bronchiectasis: Bronchiectasis is the permanent dilation of bronchi due to the destruction of the elastic and muscular components of the bronchial wall. 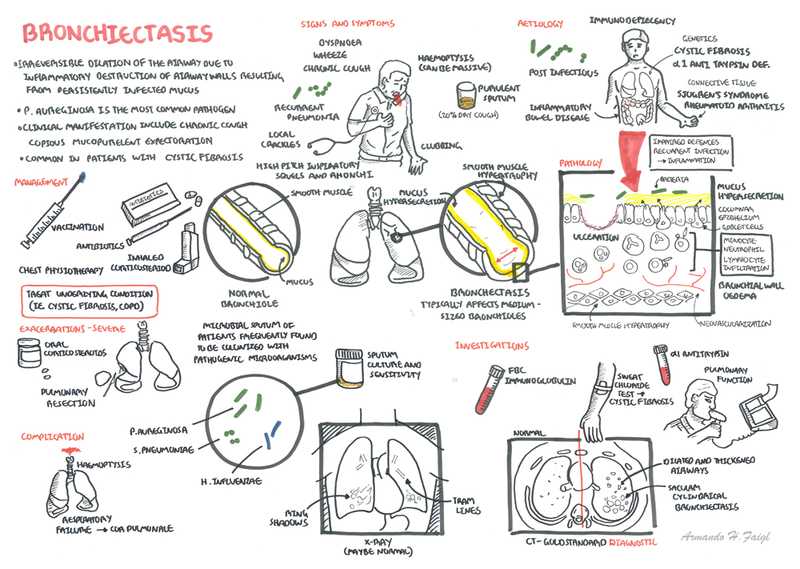 Clinical Presentation The classic clinical manifestations of bronchiectasis are daily cough and mucopurulent sputum production. 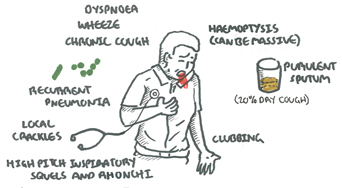 Cough is invariably present and often may be the only symptom for years. Purulent, tenacious sputum production, frequently worse in the morning (having accumulated during recumbency in sleep) is present in most patients. Presentation is usually with the background of a recent viral infection, connective tissue disease or cystic fibrosis. Can present with haemoptysis. Investigations FBC and immunloglobulin studies are important in CT is now the defining test for the diagnosis of bronchiectasis. Chest x-ray show the presence of increased pulmonary markings, ring-like structures, atelectasis, dilated and thickened airways (tram lines), and mucus plugging (finger-in-glove) appearance; however, the chest radiograph may be normal even in the presence of bronchiectasis. Aetiology The most common cause of bronchiectasis is post infection. Connective tissue disease, cystic fibrosis are other common causes. 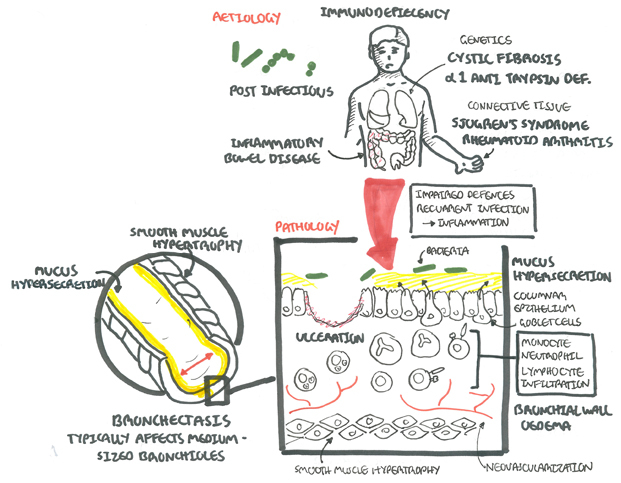 Pathophysiology Essentially the different causes of bronchiectasis with impaired respiratory defences/ immunodeficiency will trigger an inflammatory process, recurrent infections that will result in the pathological changes seen bronchiectasis. There will be bronchiole dilatation, immune cells infiltration into the tissue (lymphocytes), bronchial ulceration and oedema, smoother muscle hypertrophy and neovascularization. Patients with bronchiectasis gets recurrent infection. 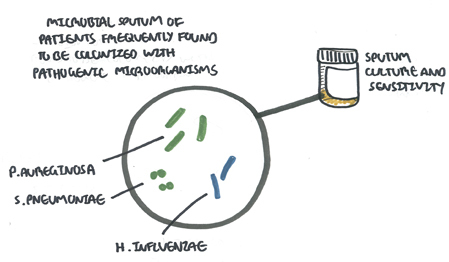 Common causes of infections are p. aureginosa, s. pneumoniae, h. influenzae, s. aureus. Infection can trigger exacerbations. 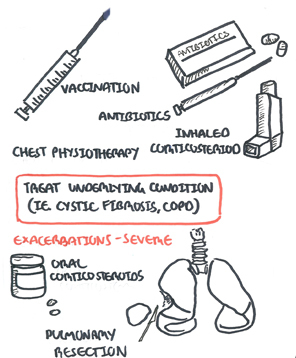 Remember oral corticosteroids for acute, major exacerbations. Management Vaccination, chest physiotherapy. Inhaled/oral/IV antibiotic used for mild-severe exacerbations. Inhaled corticosteroids is standard to decrease inflammation. Oral steroids for exacerbations. Finally pulmonary resection in selected cases with focal bronchiectasis. Bronchiectasis is an irreversible condition. The typical disease course consists of periods of symptom control interrupted by periods of exacerbations. Bronchiectasis frequently co-exists with other respiratory disease, making it difficult to determine prognosis for bronchiectasis alone. Case Files Internal Medicine 4th ed.